Unsurprisingly, the story and mystery of Clara is one of the major undercurrents of this episode, though it’s handled in such a way that it never becomes too intrusive or overt. After opening with a recorded video to set the scene in the present, it is revealed that there is a painting of Clara in 1207 where the Doctor happens to be acting as a monk. Back in the present, it’s a lengthy technical support call that bring the two back together, though Clara is clueless as to who the Doctor is and that he has witnessed her deaths on two separate occasions. Jenna-Louise Coleman easily slides into the role of Clara, and Matt Smith and she have an instantly undeniable chemistry together that should make for a fantastic pairing going forward. In fact, although there is a nod to Amy Pond through referencing her book Summer Falls, this is ultimately a throwaway and the focus remains rightly on Clara rather than the past. 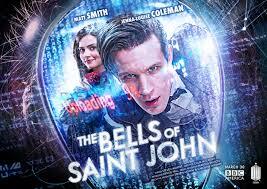 With the advent of wi-fi in everyday life, it’s inevitable that Doctor Who would eventually use it for nefarious means, and that is the case in ‘The Bells of Saint John.’ As events unfold across London, it becomes clear that Celia Imrie is spearheading a scheme that somehow uploads people and their souls to a cloud-based storage system. The Spoon creatures in her employ end up seeming quite effective as well, mobile wi-fi stations adding to the scope of the threat immensely. However, eventually the power higher than Imrie is revealed as the Great Intelligence- again played by Richard E Grant- makes a joyous return. It’s without question that Imrie has been under his control for quite some time, and the prospect of having such a powerful and secretive foe impact stories from the background is highly exciting. Matt Smith is on top form once again, and his manic energy paired with new director Colm McCarthy yields fantastic results, especially as all of London is utilized while the Doctor finds himself on varying modes of transport. Even if the sight of him zooming up the side of the Shard is a bit daft, it still somehow seems perfectly logical- and is certainly well-realized as the budget continues to be stretched for all it’s worth- within the confines of the story. McCarthy proves adept at these fast-paced action sequences just as much as he is with slowing down proceedings to develop the characters and to allow for some clever humour to exert itself. The pacing and momentum throughout ‘The Bells of Saint John’ is fairly even; despite a temporary halt as the Doctor and Clara have a cup of coffee, it manages to avoid the common mistake of needing to rush the conclusion after spending so much time on expository and core events. This allows thorough time for the Doctor to come up with the solution and to implement his hacking logically without relying too heavily on technobabble as Clara is uploaded and nearly lost for the third time in as many appearances. So although this isn’t a story that’s going to down as an instant classic, the re-reintroduction of Clara and continuing background threat of the Great Intelligence work superbly and proves that even a less overtly momentous opener than in series past can still set the scene well for the episodes leading up to the fiftieth anniversary special.